The prices of Harley Davidson bikes range from Rs 4.1 lakh to Rs 29 lakh across models. The booking for the latest bike will start from March 1 at its 13 showrooms across the country. Iconic bike maker Harley-Davidson on Wednesday launched its much-awaited and the most affordable model the Street 750 at a price of Rs 4.1 lakh in the country. "Priced at Rs 4.1 lakh ex-showroom Delhi, the new Street 750 opens the doors for a much wider base of motorcycle enthusiasts, making Harley-Davidson more accessible to a new generation of urban young adults," Anoop Prakash, Managing Director, Harley-Davidson India, said at the 12th Auto Expo. The booking for the latest bike will start from March 1 at its 13 showrooms across the country. Among the 13 models that the bike maker is selling in India, the Street 750 is the most "affordable" model, he said. The prices of Harley Davidson bikes range from Rs 4.1 lakh to Rs 29 lakh across models. Assembled at its Bawal plant in Haryana, the new bike has engine capacity of 750cc and fuel capacity of 13.1 litres. The model will also be built and exported to select international markets from the Bawal facility. "We believe the new Street 750 will excite a new segment of urban riders in India who will appreciate the attention to detail and opportunity to experience the Harley-Davidson lifestyle at an accessible price point. We will continue to adopt and invest in strategies that make our products and ownership experience accessible to more enthusiasts and customers in India," Prakash said. Besides, the company also showcased its other models such as Fat Boy, Street Bob and Street Glide at the expo. 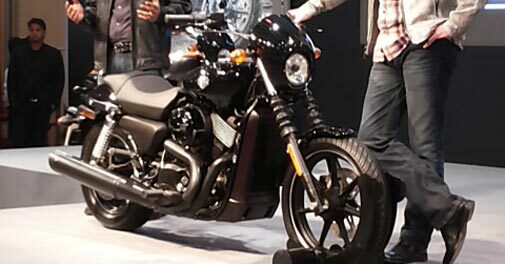 Harley-Davidson India, which commenced operations in August 2009, offers 13 models, including the newly launched Street 750, in its line-up in India, in addition to spare parts, accessories, and general merchandise. The company has 13 dealerships across India: New Delhi, Chandigarh, Mumbai, Hyderabad, Bangalore, Chennai, Kochi, Kolkata, Ahmedabad, Indore, Pune, Goa and Jaipur.